we never understand this need humans have for abandoning us for hours on end and then expecting us to be all bouncy and happy when they finally turn up! OMD PIP… Waiting fur THEM to return is SOOOOOOOO hard. And they are SOOOOOOO slow about it. Hi there Pip, that sure is a cute picture of you. We are always glad to see your happy face. Take good care. We like to think they miss us but I suspect my dogs do a lot of partying when I am gone. I bet you sometimes nap when they're gone too Pip. Or is that just me?Toodle pip!Bertie. I've often kind of wished I had a camera that could follow my boys around the house and see what they do all day when I'm not there. And now I don't have to! You are such a thrill for them to see too Mr. Pip! Aww Pip's so cute. My Sookie likes to wait in the window until every single person in our house comes home. FaRADaY: *wide eyed look* You DO?? Mowzers, we are such slackers. We could care less. Maxwell: That's not true, dood. We care! Well, Allie & I do anyways…. Pip! You're right…this is like the picture I had on my blog yesterday. Yours is 100% better, but they have the same idea in mind. Who wouldn't want to come home to you! PIp! Your mom is the luckiest to see that cute face when she comes home!P.S. We all know how hot you look in red. :O Hugs! We hope she hurries home! It would be impossible to leave you, little Pip. Hope your people came home soon Pip! 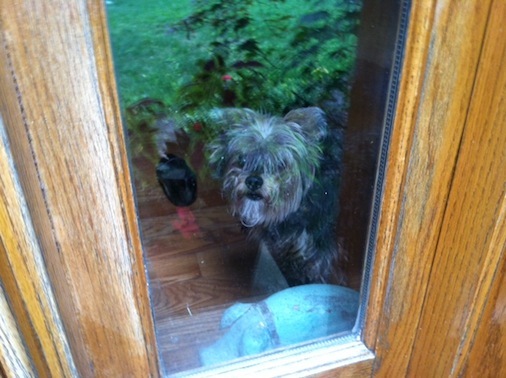 Pip… it's breaking my heart that I have to leave my girl at home… I always take her with me. But it's HOT today and I can't. And it kills me to leave her! Your face is so sweet looking through that door! Awwww. You're looking furry sweet, Pip! Here's hoping they bring you cheeseburgers when they do come home! Hi Pip, it's always good to see you even when you're waiting for your family behind the door. Pip, have you heard from Tessa the Maltese lately? I was so shocked when I discovered her blog has been deleted. I pray that everything is fine with her and her Mom. Please let me know if you knew what happened to her, thanks a bunch. We should not tell them hoomans Pipster… else they'll NEVER get to work… and and who's gonna buy us treats then *LOL* Missya ma buddy. And what a nice present to come home to! Hey there Pip! Rememmer the Shawnee Cam? Well, I has been using it to spy on our B&B guests while I am away to see wot they do. If'n you wanna take a peek, here be one the latest set of Shawnee Spy Cam pictures, BOL. http://youtu.be/Zs2bRwRxC8Y So yup, confirms wot you be saying we do when the peeps is away! Happy Gotcha Day Mr. Pip! Sending you hugs and kisses! Awww…so sweet…and here's our little secret…we can't wait to get home to our furkids when we're out! We love to be greeted by your beautiful, happy faces! Such a cute pic, Pip! Pip, You OK???? You've been waiting on that friend a LOOOOONG TIME!!! Pippy… where are yooooooooooo.. we missed ya! I just heard someone talking about them tacos… and tacos always remind me of you. Hey, Pip, we just stopped by to check on you. Hope you and your family are doing well.